WASHINGTON - President Barack Obama officially demanded that Syrian President Bashar Assad resign for the sake of his own people, saying he was no longer fit to lead after "imprisoning, torturing, and slaughtering his own people" during a crackdown on pro-reform protesters. It was the administration's first explicit demand for Assad to step down and was accompanied by an executive order freezing all Syrian government assets in the U.S. and targeting the country's lucrative energy sector. The move was coordinated with the United Nations and with U.S. allies in Europe and the Middle East and followed an intense diplomatic campaign to increase pressure on Assad. The European Union issued an identical call shortly after Mr. Obama's statement, followed quickly by similar words from the leaders of France, Britain and Germany. And just before Mr. Obama made his demand, U.N. rights investigators said Syria's crackdown "may amount to crimes against humanity" and should be referred to the International Criminal Court. In a written statement released by the White House, Mr. Obama said Assad had failed to follow through on promises to reform and instead escalated a brutal crackdown on pro-reform activists that rights groups say has killed nearly 2,000 people since an uprising against his regime began five months ago. "His calls for dialogue and reform have rung hollow while he is imprisoning, torturing, and slaughtering his own people," Mr. Obama said. "We have consistently said that President Assad must lead a democratic transition or get out of the way. He has not led. 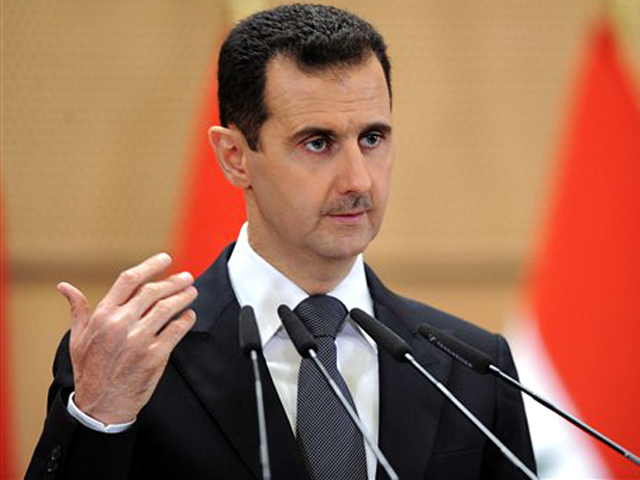 For the sake of the Syrian people, the time has come for President Assad to step aside." "It is clear that President Assad believes that he can silence the voices of his people by resorting to the repressive tactics of the past. But he is wrong," Mr. Obama said. However, the president noted that the U.S. "cannot and will not impose this transition upon Syria" and said any change must be brought about by the Syrian people. U.S. officials acknowledged the move is not likely to have any immediate impact on the Syrian regime's behavior. But they said it would send a powerful signal that Assad is no longer welcome in the international community. And they noted that the additional sanctions would further boost pressure on Assad and his inner circle. To that end, Mr. Obama also authorized the administration to impose tough new sanctions aimed at choking off Syrian revenue from its lucrative oil and gas exports. The authority allows the Treasury Department to freeze the assets of Syrian state-run petroleum companies in the U.S. and bans Americans from doing business with them. The sanctions "further tighten the circle of isolation" and "strike at the heart of the regime," Secretary of State Hillary Rodham Clinton said in televised remarks from the State Department. The order immediately bans the import into the United States of any Syrian petroleum or petroleum products. Syria is not a huge source of oil for the U.S., anyhow. But if European allies join the effort, it could significantly affect one of the regime's top sources of revenue. Syrian crude oil exports go mostly to European countries such as Germany, Italy, and France, according to the U.S. Energy Information Agency. Mr. Obama's order also denies Syria access to the U.S. financial system, freezing all Syrian government assets that are subject to U.S. jurisdiction. It also prohibits any U.S. citizen from engaging in transactions with the regime, investing in the country or exporting services to Syria. Under the order, the Treasury Department also could impose sanctions against persons who give support to Assad's government. The U.S. had already hit more than 30 Syrian regime officials, including Assad himself and members of his inner circle, and firms, with sanctions. It has also lobbied other nations to take similar steps, something Clinton predicted would come soon. "It is time for Assad to get out of the way," she said. The direct U.S. challenge to his position comes just a day after Assad reportedly told U.N. Secretary-General Ban Ki-moon that military and police operations against protesters had stopped. In a phone call between the two leaders, Ban pressed Assad on the "continued widespread violations of human rights and excessive use of force by Syrian security forces against civilians," the BBC reports. Earlier on Wednesday, Assad lashed out at the growing international reproach of his government, saying his country would not give up its "dignity and sovereignty." As Syrian protesters have called for an end to his regime, Assad has sent tanks and ground troops to retake control in rebellious areas. The military assault has escalated dramatically since the start of the holy month of Ramadan in August, with Assad's forces killing hundreds and detaining thousands. Until Thursday, the administration had said Assad had lost his legitimacy and that Syria would be better off without him. But it had stopped short of demanding his departure. Officials said the administration had waited in order to rally an international consensus behind the call. The administration had planned to make the announcement last week but postponed it largely at the request of Syria's neighbor Turkey, which asked for more time to try to convince Assad to reform, and because Clinton and other officials argued it was important to build a global consensus that Assad must go. The United States is also trying not to appear highhanded or meddlesome in a region where sensitivity to U.S. motives is high. Some of the Syrian protesters demanding an end to the Assad regime also reject any new alliance with the American government. "We understand the strong desire of the Syrian people that no foreign country should intervene in their struggle, and we respect their wishes," Clinton said. "At the same time, we will do our part to support their aspirations for a Syria that is democratic, just and inclusive, and we will stand up for their universal rights and dignity by pressuring the regime and Assad personally." Clinton on Tuesday had publicly questioned the effectiveness of the United States acting alone. Since then, however, the coordination strategy appears to have borne fruit. European Union foreign policy chief Catherine Ashton said in a statement Thursday that "the EU notes the complete loss of Bashar al-Assad's legitimacy in the eyes of the Syrian people and the necessity for him to step aside." At the same time, British Prime Minister David Cameron, French President Nicolas Sarkozy and German Chancellor Angela Merkel issued a joint statement saying that Assad should "leave power in the greater interests of Syria and the unity of his people." Earlier Thursday, a high-level U.N. human rights team in Geneva said that Syria's crackdown "may amount to crimes against humanity" and should be referred to the International Criminal Court. U.N. High Commissioner for Human Rights Navi Pillay is expected on Thursday afternoon to urge the U.N. Security Council to make that referral. The investigators say they found "a pattern of human rights violations that constitutes widespread or systematic attacks against the civilian population." In their report, they said they had compiled a confidential list of 50 alleged perpetrators at "various levels" of Assad's government. Syria insists it is rooting out terrorists but rights groups accuse Syrian troops of killing more than 1,800 civilians since mid-March. Jordan's foreign minister said Thursday that his country is "angered" and "extremely worried" by the killings of civilians in Syria and Switzerland recalled its ambassador. A day earlier, Tunisia recalled its ambassador from Syria, following the lead of several other Arab nations, including Saudi Arabia, that the U.S. has been lobbying to show displeasure with Assad. Turkish Prime Minister Recep Tayyip Erdogan on Wednesday compared Assad to Libya's Muammar Qaddafi for refusing to heed calls to change. Turkey has joined calls for Qaddafi to leave power and Erdogan said Wednesday he had personally spoken to Assad and sent his foreign minister to Damascus, but "despite all of this, they are continuing to strike civilians." In New York on Wednesday, U.N. Secretary-General Ban Ki-moon spoke to Assad demanding the immediate end of all military operations and mass arrests. In response, Assad said military and police operations had stopped, according to a U.N. statement said. But the London-based Syrian Observatory for Human Rights, which documents anti-regime protests, said Thursday that Syrian troops had shot dead nine people in the central city of Homs on Wednesday night. Another rights group said Assad's crackdown also killed nine people elsewhere in Syria on Wednesday.